The difference between the G3M2 and G3M3 is that the latter had more powerful engines and was built solely by Nakajima. Externally, they were identical. Those who have been around a while will know that this is not the first 1/72 kit of this aircraft with LS producing a version way back in the heydays of modeling during the early 1970s. While not a bad kit, it is crude by comparison and is undersize. Even this kit is not ultra new as Hasegawa has been producing this one sporadically for almost 20 years. Like all Hasegawa kits, the external detailing is superlative. The interior detailing is not too bad either, but somewhat basic. 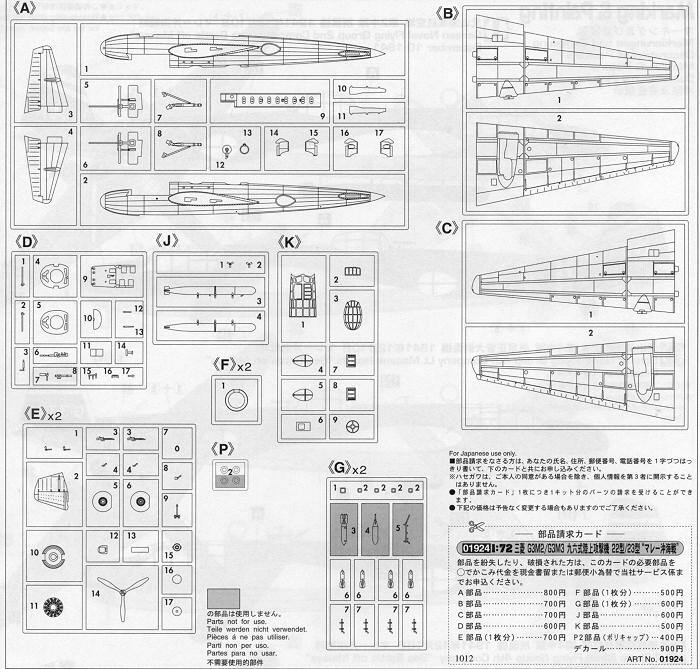 There are decals for the instruments, which is somewhat standard stuff for most 1/72 kits. The cockpit has no sidewall detail with a pair of seats, control wheels and what I guess is a bomb release handle on the floor (since I do not think bombers have a parking brake). Platz does a nice Eduard-produced p.e. set to help the interior. Behind the pilot is the bomb aimer's position with a seat and sight along with a pair of bulkheads. The side gunner's position appears to only be able to be built with the guns stowed. This is not true of the upper gun positions. In fact, the forward upper turret can be built either extended or retracted. One has to decide which markings scheme is to be done about a third of the way through the build and there are notes showing which bits are appropriate for which markings option. The kit can be built with the lower entrance hatch open or closed, with the upper cockpit hatch open or closed, though only as a torpedo bomber. The bits for the level bomber are not included. Apparently Nell did not have a standard bomb bay with doors so all loads are external of sorts. Prop spinners are also provided, but not used on either option. This is the base boxing so finding it will not be all that difficult. Limited editions sell out very quickly on the average, but unless you are fussy about markings, these are the ones to get. Markings are provided for two aircraft. One is the box art plane from the Genzan Kokutai that took part in the sinking of the Prince of Wales and Repulse early in the Pacific war. It is in the green/brown/grey scheme of the time. The other is from the 951st Kokutai in mid-1945. It has upper surfaces in overall green and a nice, colored fin stripe. 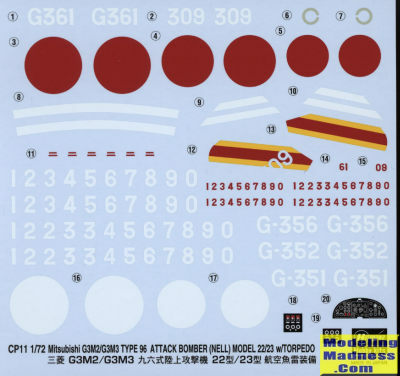 Decals are quite well done and you are provided with multiple aircraft number options for the first scheme. Decals are nicely printed and provide the white surround to the hinomaru where required. As many have pointed out, Hasegawa kits tend to be pricey in the US. I shop all the time in Japanese stores and purchasing several items at one time really reduces the shipping cost per kit. 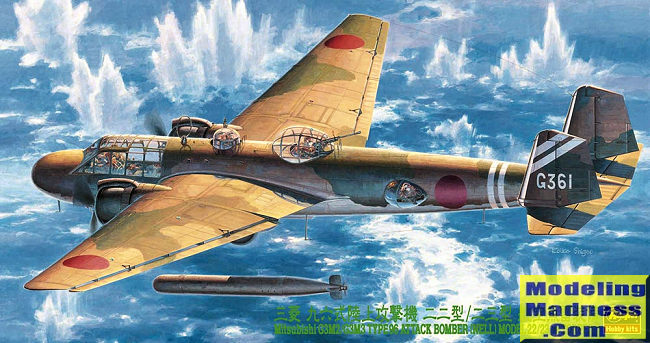 In the end it is a very nice kit of this important early war Japanese bomber.